If you still lack the motivation needed to kick-start your recycling efforts but appreciate energy efficiency, a team of chemists may have just the innovation to get your engines revving. Researchers from the Shanghai Institute of Organic Chemistry (SIOC) and University of California, Irvine (UCI) have discovered a new way to process the millions of tons of waste plastic we produce each year into usable fuel. As described in an article published this month in Science Advances, the project involved developing a method for using byproducts of oil refining processes to break down polyethylene plastic, the most common commercially available type, into useful compounds of polymer molecules, including liquid fuel. In recent years, researchers and companies around the world have been exploring how to better utilize certain waste products as resources, from re-imagining used cardboard to recycling unused nuclear fuel. The Ocean Recovery Alliance’s Doug Woodring and the American Chemistry Council’s Steve Russell told Live Science in 2012 that because plastics are predominantly made using energy feedstocks from oil or natural gas (typically the latter in the U.S.), the stuff is particularly suited for reclaiming some energy from our waste stream. 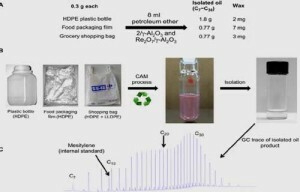 The push to develop “waste-to-energy” options for our garbage has already had various companies processing plastic bags and bottles into liquid fuel, but methods-to-date have required the use of toxic, caustic chemicals (called “ radicals”) and large energy expenditures to break down the bonds between polymers, UCI and SIOC researchers point out. 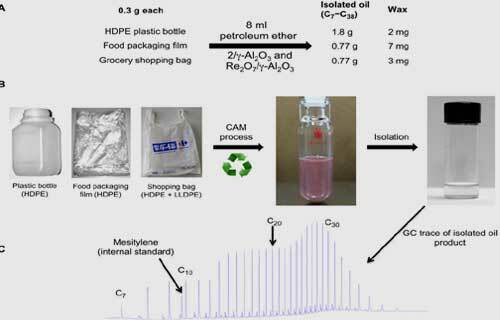 With their new method, waste plastics are instead broken down more efficiently through a process called cross-alkane metathesis, which uses “readily available” byproducts of oil refining as catalysts.